Top 5 Mountains to Go Hiking in the Philippines -- to See the Most Amazing Views! The Philippines has plenty of nice hiking sites, where you can enjoy picturesque scenery, breathing fresh air, as well as hearing vis-à-vis smelling nature’s gifts to mankind. Furthermore, as a powerful cardio workout, you’ll lower your risk of heart ailment; have better blood pressure, blood sugar levels, good bone density, and many other health benefits, through this great outdoor activity. 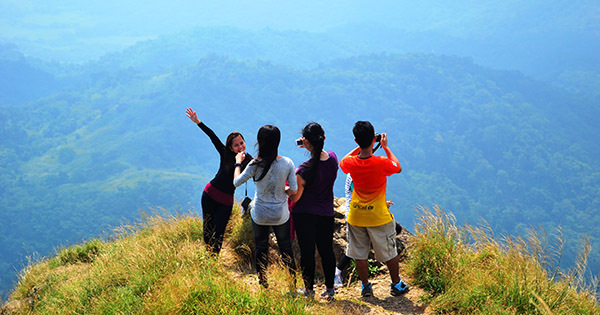 #1 - Pico de Loro: Life is about braving the storms, as well as having fun, too! So set out for a wonderful journey over at General Emilio Aguinaldo, in Luzon and hike Pico de Loro, the peak of which is shaped like a parrot, hence its name. Not for the faint heart though, climbers are required to rock climb, cross rivers, rappel, bring an umbrella or harness, sun block and water. Camping is not allowed there anymore so you got to get there really early. #2 - Banahaw: Famous among mountaineers, Banahaw can be found in Kinabuhayon, Dolores, Luzon via its entry point called Bangkong Kahoy Valley. Gaze at its spectacular view, be welcomed by very accommodating locals, and grab a bottle or two, or more, of their popular Wild Raspberry Lambanog drink. Brace yourselves though for a kilometer-long dirt road in this adventuresome trail, after trekking Barangay Kinabuhayan. #4 - Anawangin Cove via Mount Pundaquit: A good amount of hiking is needed to get to Anawangin Cove, instead of riding a boat. As you reach this marvelous tourist attraction in Pundaquit, Luzon, make sure you have readied your sun block lotion, a hat, and other protective covering, as the sun’s heat can be scorching there. Moreover, prepare enough water to endure the steep assent in this amazing trail. #5 - Mount Pinatubo: Well-known as a hot trekking site in Botolan, Luzon, Mount Pinatubo, is an active strato volcano, which had very memorable volcanic activities way back in 1991, when its eruption’s effect was felt worldwide. Many things to look forward to in Mount Pinatubo actually, which include the ride using a 4x4 amidst 20- meter stretch of sand around, a breathtaking view of its crater lake after a relatively easy hike, a picture perfect view at the top, etc. Be sure to wear slippers though since this trail needs riverbed walking, where you’ll step onto rocks and lahars...but then, who cares? Let the thrill begin!